Keesing Technologies was founded in 1923 and leads the way in digital ID document and banknote authentication solutions. The objective of Keesing Technologies is to help organisations prevent counterfeiting and combat fraud by providing the world’s best authentication solutions. To this end, we market a range of printed and digital solutions that allow users – from document professionals to untrained staff – to assess the authenticity of nearly all ID documents and banknotes currently in circulation. Solutions that provide you with the assurance of a document’s authenticity. The technology we use is powered by nearly 100 years of experience and accumulated knowledge. Thousands of organisations around the world rely on our solutions. Every day. Keesing Technologies is the owner of the world’s most comprehensive source of genuine ID documents and banknotes. A database which provides you authoritative access to international ID documents and banknotes from over 200 countries. The database, which powers all our products, includes detailed descriptions and high-quality images of thousands of passports, ID cards, driving licenses, visas and banknotes. Keesing’s objective is to develop the highest quality products and services. To achieve it, we cooperate with international government agencies, as well as embassies, consulates and central banks. Keesing serves more than 6,000 organisations, including government agencies, security printers, temporary employment agencies, insurance companies, banks, telecom providers, solicitors and airlines. Keesing has offices in The Netherlands, France, and the USA, and collaborates with distributors, strategic partners and agents all over the world. On the 1st of January 2010, Keesing had been acquired by SURYS (the former Hologram Industries Group). Founded in 1984, the group designs, manufactures and sells authentication and anti-counterfeiting solutions worldwide. SURYS’ expertise is based on 3 technologies: photopolymer holograms, optical nano and microstructures and digital signature and internet search technologies. The group employs over 200 employees. 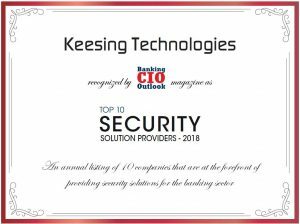 Keesing Technologies has been chosen by Banking CIO Outlook as a top 10 Security Solutions provider 2018. Read more about it in their article! Keesing Technologies is committed to nature and a clean environment. We strive to limit the environmental impact of our activities, e.g. by complying with the regulation of the ICPE (Installations Classées pour la Protection de l’Environnement). Each year, Keesing contributes to the preservation of the environment, by compensating its CO2 emissions. You can view our certificate here. 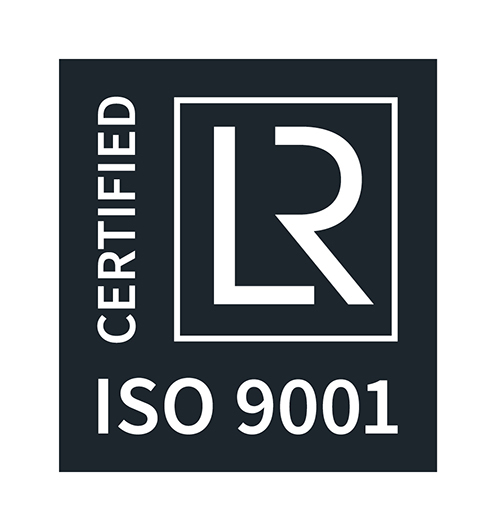 Keesing Technologies is proud to be an ISO 9001 registered company. Keesing is committed to delivering excellence in quality. We are dedicated to driving continual improvement throughout our business to deliver the best solutions and services possible. ISO 9001:2008 specifies requirements for a quality management system where an organization requires the ability to consistently provide conforming products, either material or services to meet a customer’s expectations. View our ISO 9001-2015 certificate. By obtaining the prestigious ISO 27001 certification, Keesing Technologies demonstrates its longstanding commitment to security, operational excellence and its ability to handle client information in a highly secure manner. This certification allows Keesing to further strengthen its dedication to establish a relationship of trust with its clients regarding the way information is secured and managed effectively. ISO 27001 is the leading international security standard. The standard clearly defines the requirements for establishing, implementing, operating and maintaining a documented information security management system (ISMS). View our ISO 27001:2013 certificate.